Keeping kids safer is everyone’s business. 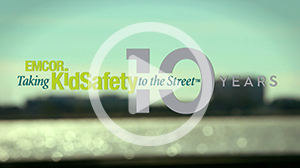 In 2005, EMCOR launched Taking KidSafety to the Street™, a three-part initiative to help find missing children and promote child safety on the streets, in buildings, and at home. 405+ missing children recovered since 2005. EMCOR vehicles travel roads and highways all over the country, which means our vehicles are seen almost everywhere. To capitalize on this visibility, our nationwide fleet of over 6,000 service vehicles displays missing child posters from the National Center for Missing & Exploited Children (NCMEC). In 2009, we launched the EMCOR Street Gang. Over 600 employees immediately jumped at the opportunity to carry a poster of a missing child on their personal vehicle. These easy-to-see posters are tailored by region, based on where law enforcement believes the pictured children may be located. What’s more, the posters are changed every month. EMCOR is the proud national sponsor of NCMEC’S Code Adam, the protocol used in a store or public facility when a child is reported as missing and before law enforcement arrive. Code Adam has been adopted by 5,000 businesses and implemented at over 92,000 locations in the U.S. and abroad. We make the Code Adam training available to interested parties at no charge. Families and children can learn how to stay safer with our and accompanying KidSafety certificate. Children can take the KidSafety Challenge to test their knowledge and once completed, they can print out a personalized KidSafety certificate. Our communities. Our children. Our future. Taking KidSafety to the Street. In 2016, the National Center for Missing and Exploited Children (NCMEC) launched Safety Central, a free child safety app available for Apple and Android devices. The app is designed to provide parents and guardians with tools they need to help protect their families and act quickly should their child go missing. EMCOR Group sponsors the app.